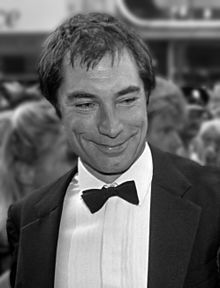 Timothy Peter Dalton (born March 21, 1946) is a Welsh-born British actor of stage and screen, famous for being chosen as the fourth official James Bond. This is a film that really inhabits the proper world of James Bond. I mean, James Bond lives in a world that is violent and dangerous. On The Living Daylights, reported in Edward Gross, His Name was Bond, James Bond: Timothy Dalton on the World of 007. I don't believe Bond is superman, a cardboard cut out or two-dimensional. He's got to be a human being. He’s got to be identifiable, and that's what I'm trying to be... It's not a spoof, it's not light, it's not jokey. On his version of James Bond, reported in Edward Gross, His Name was Bond, James Bond: Timothy Dalton on the World of 007. On Casino Royale. "Timothy Dalton Reflects On 007". MI6 - The Home of James Bond. 2007-02-19. Retrieved on 2007-02-21. It was a remarkable time of my life. I don’t think anyone except the few people who have played James Bond can tell you how strange and special it is and how much your life changes. I have no regrets about doing it at all. On playing Bond. "Timothy Dalton Reflects On 007". MI6 - The Home of James Bond. 2007-02-19. Retrieved on 2007-02-21. On the difference between his and Roger Moore’s portrayal of Bond. Several Interviews with Timothy Dalton on his 007 portrayal. Archived from the original on 2000-03-04..
Richard Burton was Welsh; Tom Jones is Welsh, and we Welshmen like to think of ourselves as heroes - on screen and off! On the land of his birth. Several Interviews with Timothy Dalton on his 007 portrayal, including Introducing Timothy Dalton by Glenn Fuller in Prevue Magazine.. Archived from the original on 2000-03-04.. The question of what is good acting has got to be paramount in order to keep developing. If you cease to think about it, you cease to develop. There's the showy style and the acting that doesn't look like acting. I go for the latter. On acting. Several Interviews with Timothy Dalton on his 007 portrayal, including ‘Licence to Act: Timothy Dalton Uses James Bond To Get What He Wants’ by Marshall Fine, taken from ‘Lifestyle’ magazine, 11 July 1989.. Archived from the original on 2000-03-04.. If you behave like a regular guy, you get treated like a regular guy. You can't cut yourself off from the world. You ultimately would go crazy, wouldn't you? On fame. Several Interviews with Timothy Dalton on his 007 portrayal, including ‘Timothy Dalton Won’t Let Bond Role Change His Career by Susan King of the ‘Los Angeles Herald Examiner’. Archived from the original on 2000-03-04..